"Together they eat, sleep, fight, snore, dart and chase each other around constantly, every day!" 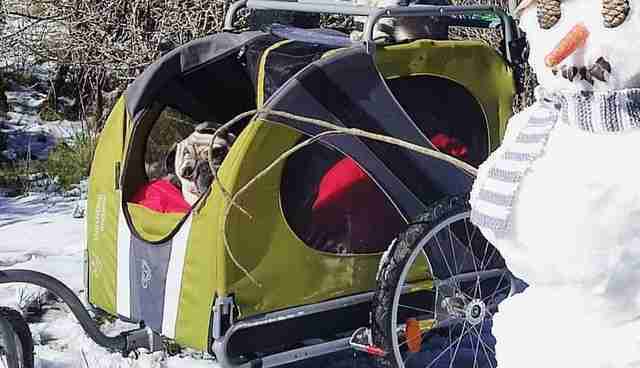 Ever since the day they met, Bandito the pug and Luigi the cat have been the very best of friends. 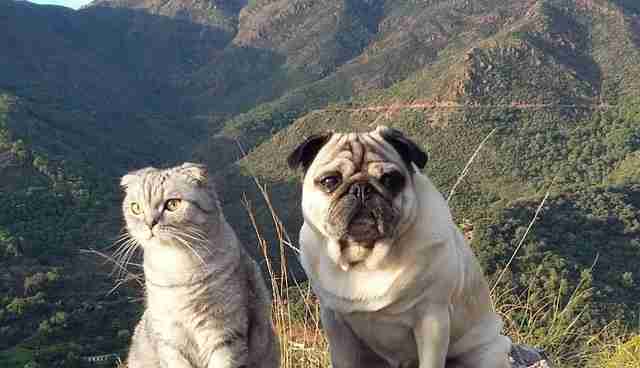 A cat and a pug might not sound like a typical duo, but these two brothers just make sense, and are always together. "They just clicked," Finn Paus, the pair's dad, told The Dodo. "Together they eat, sleep, fight, snore, dart and chase each other around constantly, every day!" 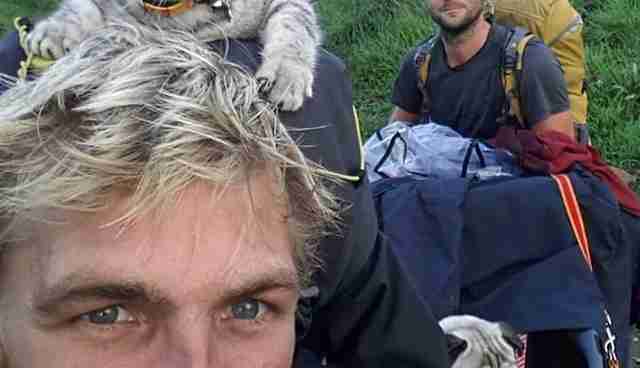 Not only are these guys an unlikely duo, they also do some unlikely things together - like, for instance, hiking miles and miles across Spain together. 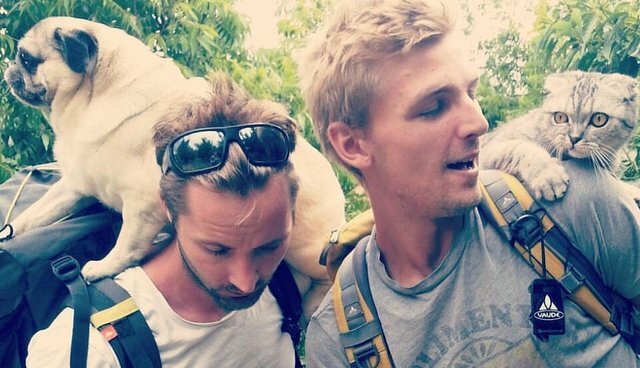 When Paus's parents passed away, he and his partner Seb Smetham realized how short life was, and wanted to do something meaningful with their time. 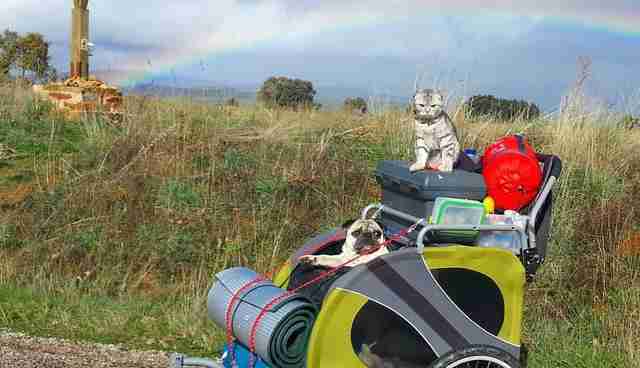 And so they packed up Luigi and Bandito into a dog trolley, grabbed some camping gear and set off on a trip that lasted 46 days and over 400 miles. 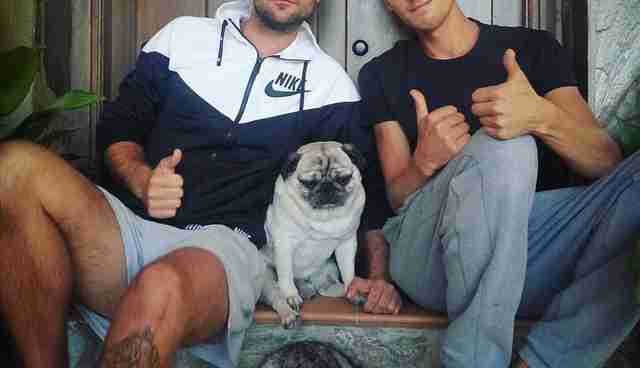 "The walk across Spain was a life changer for us," Paus said. "After the walk we never went home. 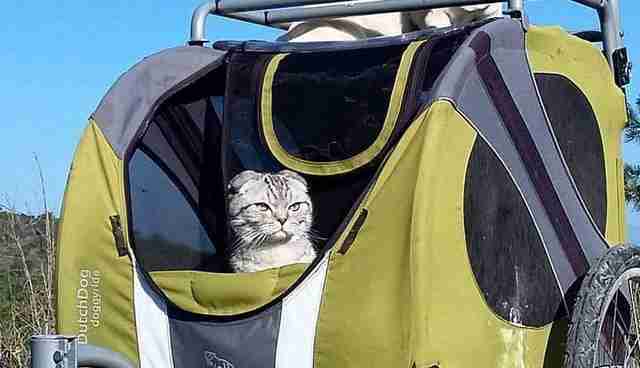 We bought an old builder's van and found a new place to live!" 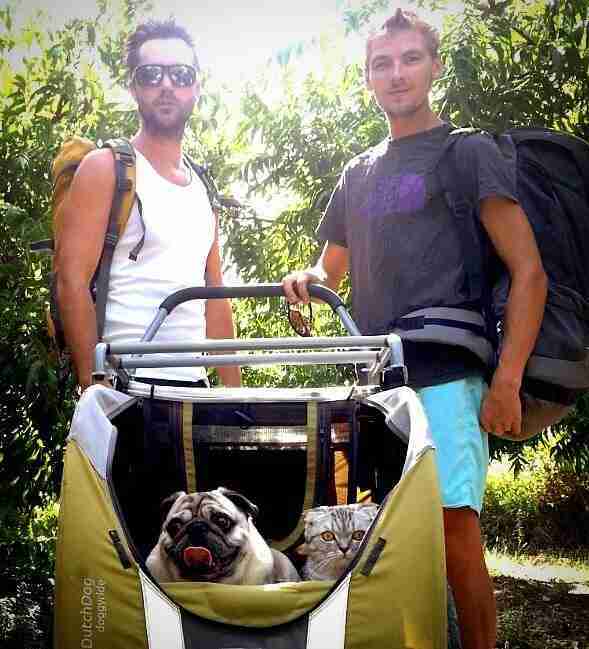 Now the adorable group goes hiking and camping together all the time, and in total, they've hiked over 900 miles. 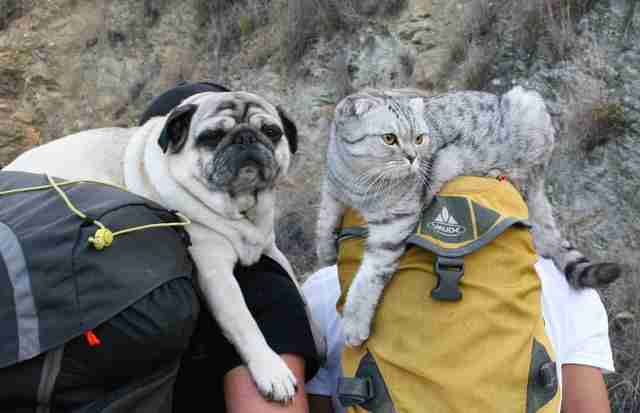 Cats and pugs aren't exactly known for being active, but Bandito and Luigi love hiking anywhere and everywhere with their dads - especially since they barely have to do any walking at all. ... they're perched happily on their dads' shoulders instead, and get to see the world all while exerting practically no energy at all. A pretty sweet deal. ... and, of course, just being active in general. Bandito and Luigi even have a children's book about their adventures coming out soon, and their dads couldn't be prouder. 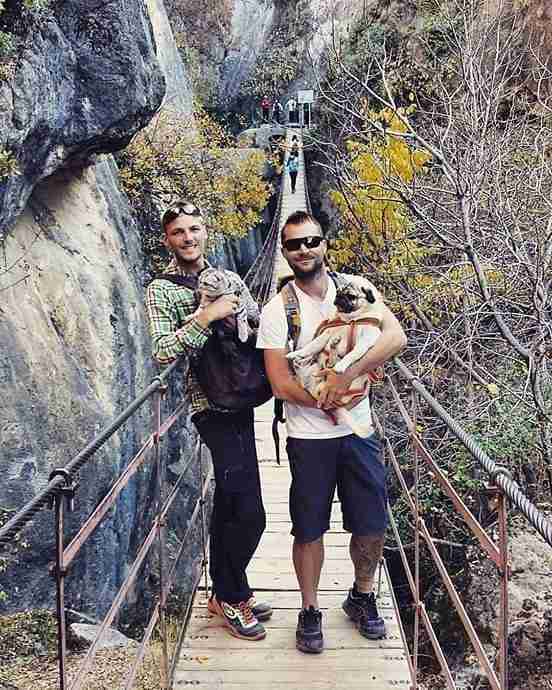 While the pair loves hiking with their dads, really, they just love being together. As long as they have each other, they're down to do anything. You can follow this adorable group and all their adventures on their Facebook page.